I am so thrilled to be nominated twice in one week for another blogging award! 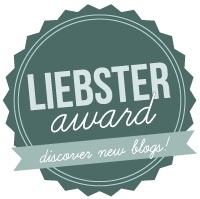 This time it is the Liebster Award and the talented blogger responsible for this terrific honor is Roxanne Tan of The Lemon & Jar. I can’t tell how good it feels to be recognized by other bloggers for my labor of love, SimpleandHealthyFoods.com. Roxanne is a newbie to the blogging world. She has lived in Australia since the age of twelve, but was born in Malaysia. A graduate of accounting and finance, Roxanne decided to follow her passion for food and became a nutrition student. She believes in the power of food as a way “to bring people together, to make people smile, to heal, to nourish.” Please check out her beautiful blog, The Lemon & Jar, if you haven’t done so already. I am so grateful to Roxanne for this special honor. Thank whoever nominated you, by including a link to their blog. Answer the questions asked to you, by the person who nominated you. Then make a few questions of your own for your nominee(s). Nominate a blogger(s) of your choice, who you think deserve to receive this award. Inform them that they have been nominated. (You can nominate the person nominating you). What got you into blogging in the first place? My daughter leaving for college. Sweet or savory? That is very difficult to answer, but I will say sweet. What inspires you to write new posts? Pictures of beautiful food. What’s your favourite place in the world? My home! Your favourite vegetable of all time and why. My favorite vegetable is the potato, because I love French fries! Do you have a pet-hate, i.e. something that annoys you? People who don’t live up to their word. What’s your secret guilty pleasure? Chocolate! It is my pleasure to nominate How to $tuff Your Pig. The blog is primary dedicated to “helping others navigate the world of personal finance.” For the past month, I have been following her blog and found it to be very insightful and helpful. What do enjoy most about blogging? When you are not working or blogging, how do you like to spend your “free” time? What is your favorite thing you like to splurge on? If you had one piece of advice to give young adults, what would it be?